"We like the combination of coffee ad betroot juice here, balanced by the maple syrup – a classic fusion of bitter and sweet." 1. Put the ice cubes into a cocktail shaker and add the coffee, beetroot juice and maple syrup. Shake vigorously. 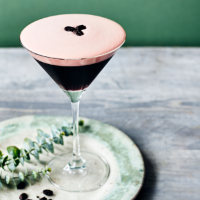 Pour into two chilled martini glasses and garnish each with a few coffee beans.